You blink your eyes and all of a sudden two weeks have passed, and it’s time for another Carnival of Mathematics! 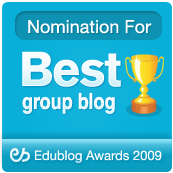 This one, the 48th edition, is being hosted by the group blog Concrete Nonsense. As usual, there is a whole bunch of great stuff there, from models of how long people spend in coffee shops to integrals, cabbages, music, and the US Constitution. The January 2009 issue of The College Mathematics Journal has a Pythagorean theme. While the articles consist of the usual mix of varied mathematical topics, most of the smaller sidebar inserts contain quotes from books or articles about Pythagoras, and the issue concludes with reviews of recent books by Eli Maor and by Christoph Riedweg on the Pythagorean Theorem and the life of Pythagoras, respectively. I love the simplicity: illustrating the fundamental ideas of relating the lengths of the sides of a triangle to the areas of the squares on those sides using readily available materials. I do have one nit to pick, though. If the intent was to illustrate a right triangle, then the arrangement of hazelnuts is off. To my eye, the hazelnut grids look exactly like pins on a Geoboard, or lattice points in the plane. And given that perspective on this image, we see a 2-3-4 triangle, an obtuse triangle, and squares of area 4, 9, and 16. Here we can view the diameter of each hazelnut as being our unit of length, so that the circular area taken up by each hazelnut suggests the unit of area (the circumscribing square) . This image differs from Bochner’s piece in a critical way: Bochner has arranged his hazelnuts with relatively large gaps between each nut, while in the schematic I’ve abutted them to one another, as one would do if the diameter of each nut was a unit of length, and the nuts were being used as a measurement device. The large amount of space between the nuts is akin to lattice points in the plane, in which it is the gap itself which constitutes the unit of length, and the vertices (or hazelnuts) are our attempt at an approximation to ideal points in the plane. In the end, I find Bochner’s Meditation rather confusing, and to some extent disappointing. To go along with yesterday’s post, here is another fun “Find the Pattern” problem. I got this from Helen Timberlake, but I’m not sure if it was her creation or not. This sequence was the favorite pattern of my former department chair, Nelson Rich. I thought he invented it, but a quick search on the internet reveals that it’s pretty easy to find if you search for the first few terms. But don’t do that! It’s a sneaky one, but fun to try and figure out. If you want a hint, click here. Our seniors are taking their comprehensive exams, a department requirement for graduation, this weekend. They’ve been studying for months (literally — we gave them the review packets last April and I know several people were working on them this summer) and now The Time Has Come. Last week one of our seniors sent me this poem that she’d written in honor of the occasion, and she gave me permission to post it here. The math majors were studying, stuffing their brains full of knowledge. In hopes that their proofs had the right “we assume”. With visions of scoring at least a 76. The math majors looked up to see what was the matter. Someone was crying, sure she wasn’t going to pass. And she needed help with derivatives on the double. A Solutions manual complete with p-series that diverge! They knew in a moment they were going to pull through. They cheered and shouted and read the table of contents. On epsilon delta, and z-score charts. To contrapositives! To proofs by induction! The formulas made sense; they weren’t so fuzzy! Through linear, statistics, calc one and calc two. With enough “hence’s” and “thusly’s” for their professors to approve. They stretched their legs and refilled their coffee. They studied and studied doing all the questions required. Their eyes – how they drooped! Their faces not so merry! Their minds were fried, their stomachs empty. The math majors went home to their beds. “What’s wrong?” they asked, with concerned looks. But couldn’t find a person to acknowledge. The students relaxed; they were glad to be bored. They all passed and got every question right! Nebraska has a lottery. One of the games is “Pick 3”, where each player selects 3 one-digit numbers, and once a day a computer selects a winning sequence. The player wins if they have the same three numbers in the same order. Monday (Jan 19, 2009), the winning numbers were 1-9-6. One lucky Nebraskan had bet the same combination, winning the top prize of $600. The news accounts of this event say that the two drawings were done on different computers (preempting the unspoken suspicion that there was some systematic error in the process). According to the Associated Press, the probability of this happening are one in a million. And indeed, there are 1,000,000 possible combinations of winning numbers over two consecutive nights, since if you just concatenate the digits you get all the strings from 000000 to 999999. But to say the probability is one in one million means you’re measuring the probability of having 1-9-6 come up a winner in both drawings. Most readers of the news story probably aren’t struck by that specific combination, but merely from the fact that the two numbers agree. That sort of coincidence is far more likely to occur, with a probability of 1 in 1000 (since there are 1000 possible draws on Tuesday, and only 1 of them will match Monday’s combination). The probability that two consecutive draws do not match is 999/1000. But the probability that after n+1 drawings, no consecutive pair will match, is . For n=366, we find that the probability of no matching pairs to be roughly 70%, which means that over the course of one year of Pick 3 drawings, there’s a 30% chance of having the same numbers win two nights in a row at least once that year. In two years of Pick 3 drawings, there is a more than 50% likelihood that the winning numbers will match on some pair of consecutive evenings. I celebrated a Presidential Age for the last half of 2008. By that, I mean I was 43 years old during the term in office of the USA’s 43rd President. And in fact, later this coming year I will turn 44, and have a second Presidential Age. experiencing three or more is rare but possible, and has happened in our nation’s history. In what follows, I want to prove the first statement, explore the likelihood of the second, and give examples of the third. Everyone who lives long enough will experience a Presidential Age. Assumptions: A) People live arbitrarily long lives, and B) over the course of your life, the mean length of a Presidential term in office will be greater than 1 year. For the Age and Prez functions, though, it is significant that they are integer-valued, their values only increase, and they always increase by exactly 1. Thus the only way my Age can first become strictly larger than the Prez number is if I have a birthday (so my Age jumps by 1) on a day when there is no change in administration (so the Prez number stays unchanged), and hence just prior to my birthday my Age must have actually matched the Prez number. Clearly lots of people will have more than one Presidential Age. Anyone who turned 43 between January 21, 2007 and January 19, 2009 will have been 43 years old during the GWB era, and will be 44 years old during the BHO era. But those who turned 43 earlier during the Bush presidency will have missed their chance, having turned 45 before President Obama took the oath of office. The likelihood of getting a second Presidential Age depends, then, on the length of the term of the relevant President. If all Presidents served their full term in office, then in order to get more than one Presidential Age, your Age and Prez numbers must first coincide within two years of the end of that President’s term, and we’d expect this to occur between 1/2 and 1/4 of the time (depending on whether that president served one or two terms). Richard Nixon was our nation’s 37th President. He resigned the presidency on August 9, 1974, and was succeeded by Gerald Ford. Jimmy Carter followed as the 39th President on January 20, 1977. An individual whose was born between 1/21/37 and 8/9/37 would have been 37 during the last months of the Nixon administration, 38 during Ford’s, and 39 at the beginning of Carter’s term in office. A more extreme example occurs in the 1840s, with the death of William Henry Harrison just one month after taking office. In that case, anyone who was nine years old between March 4, 1841 and April 4, 1841 would have three Presidential Ages (8, 9, 10). In principle, it is possible to have more than three Presidential Ages, although for that to happen would require consecutive abbreviated terms in office, something our nation has never experienced, and hopefully never will. The 47th Carnival of Mathematics is up today, courtesy of regular host jd2718. The number 47 appears a lot in Star Trek (particularly Star Trek: The Next Generation), so this Carnival is written with a Star Trek theme in mind. Now I’m torn between reading more of the math posts and reminiscing about ST:TNG, which I used to watch every week in college. But fortunately the weekend is only half over, so there is plenty of time for both. Enjoy! The photo of George Takei is by Zesmerelda, licensed here under Creative Commons. And OK, he’s in a parade, but that’s LIKE a Carnival. Edited 1/18 to add: This post was actually written by Ξ, not TwoPi — I wrote it before realizing that TwoPi was logged in, and am not sure how to change the authorship. Whoops! And this wouldn’t be a big deal, of course, except that TwoPi is a fan of the original Star Trek, not so much TNG. I see a LOT of my students pull out their calculators to do basic arithmetic these days (multiplying a two digit number by 2 or 3, or adding two 2-digit numbers). I’m often surprised during a calculus quiz to see someone use a calculator to check their integer arithmetic (in combining like terms of an algebraic equation, say). I’m heartened to hear laughter in the video, and wonder just how long it will be before American audiences see nothing uncomfortable or amusing in an adult needing a calculator to find 500+500. I’m reminded that in laboratory studies of human responses to stress, one of the standard ways to ethically induce stress on test subjects is to have them perform multidigit subtraction in their head (e.g. count down from 483 by sevens) while the experimenter urges them to work more quickly. Thank you to Ionica at wiskundemeisjes, who brought this Friends scene to our attention, and suggested that we both post about it on our blogs simultaneously! On which day are they predicting that it will be 11°F (or -12°C)? The Blue Men want you — yes, YOU — to use your mathematics skills for a contest! Well, if you’re a high school student that is. They are inviting “high school science, performing arts, and math students” to enter a contest to create a musical instrument out of unusual items (for inspiration, think of the PVC pipes that they use in their performances). But act quick — the deadline is January 15! The official stuff is here. Speaking of the Blue Man group, did you know that they opened an elementary school in New York City this past fall? It’s called the Blue School and the classroom reminds me just a bit of one of their performances, although the $27K price tag is a bit out of my range (though apparently standard for NYC private schools). Blue Man photo published here by Stefan-Xp under the GNU Free Documentation License. While we were in DC, we managed to sneak in a visit to the Museum of Natural History. And right next to the Hope Diamond (which, umm, looked surprisingly small. I’d envisioned something fist-sized, which goes to show how little I know about diamonds) there were some really cool rocks. The first thing I saw were balalt columns. Yup, a perfect hexagon pentagon. But there were a few hexagons around it, and it was pretty neat looking. Then I saw cubes. Lots and lots of cubes, because a bunch of crystals grow that way. 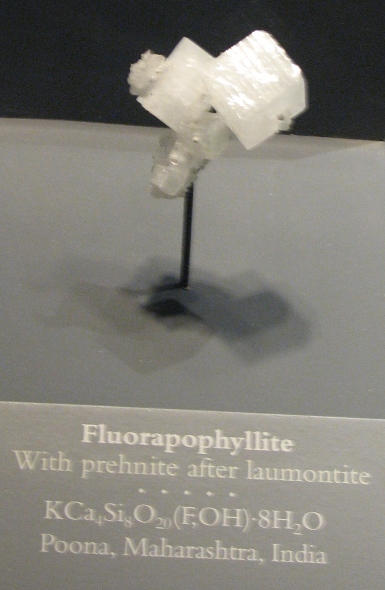 There was this Fluorite from Spur Mountain mine, Cave in Rock in Illinois. 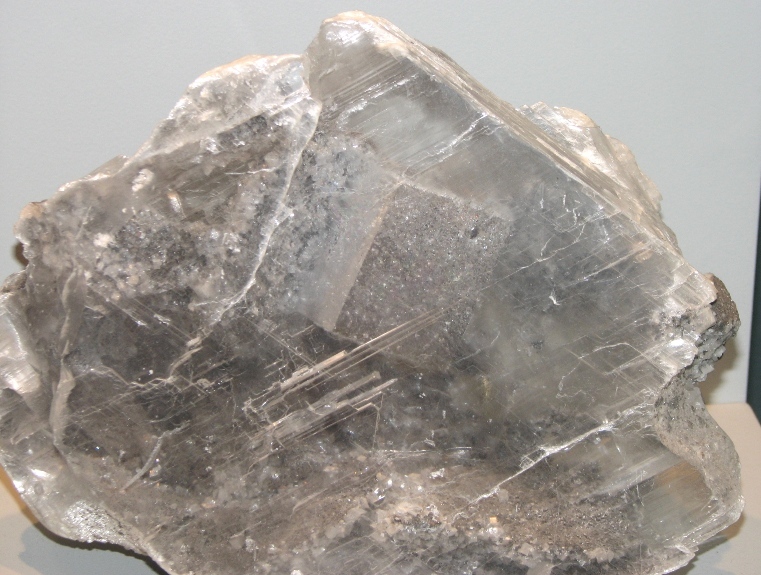 And these cubes of fluorapophyllite from Poona, Maharashtra in India.They were clearer in real life. Then there’s this fluorite in gypsum, which is neat both because the cube is embedded in a see-through rock and because it’s from Penfield, which is just down the street from Rochester. Seriously, you could pretty much walk there, and it’s an easy bike ride. Does anyone know if these rocks are related to the stuff that’s in toothpaste? If shiny is more to your liking, here’s a whole bunch of Galite cubes from Missouri. Here’s the sign. I like taking pictures of signs. 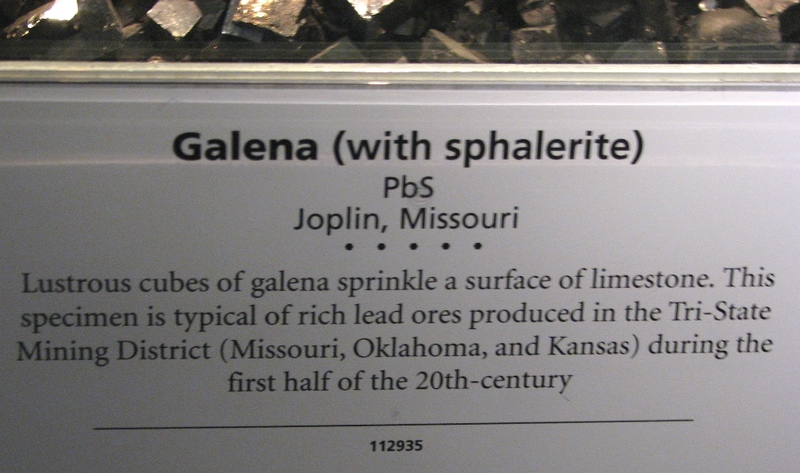 Otherwise, how would you know that there’s sphalerite mixed in? And then check out this Pyrite. It grows in two ways: cubes and dodecahedrons, and this photo shows examples of both. 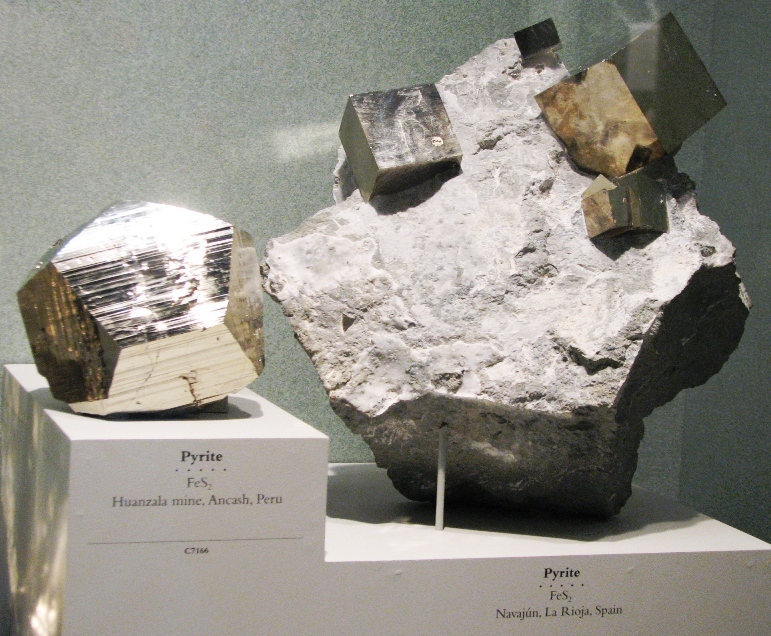 I love pyrite. I can’t wait to go back to the Smithsonian again.